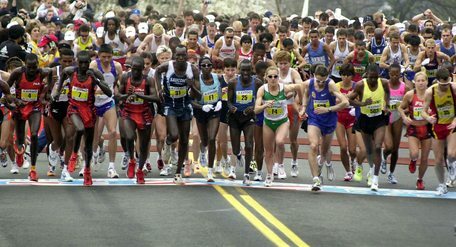 On Monday, April 19, just under 30,000 runners will start the Boston Marathon, the world’s oldest marathon. Qualifying times are arranged to ensure only the best, most dedicated athletes can attain entry. For 34-and-under athletes that translates to 3:10 for men and 3:40 for women. He said, “The year I took second to Al, I knew I could run fast. Coming up to the start line and looking down the first hill, I thought of running in the footsteps of Johnny Kelley, Clarence DeMar, and Tarzan Brown.” That day Beardsley himself became a Boston legend, losing to Alberto Salazar by seconds because a police motorcycle cut him off on the final turn to Boylston Street. This year’s elite field will ensure a competitive and fast race. The 2009 running featured the closest women’s finish ever (and possible). Salina Kosgei of Ethopia out kicked her teammate Dire Tune to win by one second. Tune collapsed on the finish line and had to be taken to the hospital for dehydration. Both beat American Kara Goucher by nine seconds. Goucher will not run in 2010, but look for Mexico’s Maidai Perez, who had the fastest women’s qualifying time. On the men’s side, the United States boasts two favorites including 2009 New York City Marathon champion, Meb Keflezighi, and last year’s third place finisher, Ryan Hall. Hall has been on marathon major podiums before; maybe 2010 will be his year to win. Both will be challenged by defending Boston and Olympic champion, Deriba Merga. The real story of Boston must be seen as a spectator or experienced as a runner. When I ran Boston last year, as a slow-footed charity entry, some 22,000 plus runners out kicked me to the finish. As I ran in their footprints and Gatorade puddles, I took a moment to slap little kids hands, take oranges from the locals, admire the quintessential New England architecture, and smile in the Wellesley scream tunnel. Crowds packed the 26.2 mile course several deep cheering for athletes fast and slow (like me). Following 1976 Boston champion, Jack Fultz’s advice, I made sure to negative split the race through Heartbreak Hill. After passing Heartbreak and Boston College, I got my mojo back on the downhill ghost mile #20. Rounding Cleveland Circle to Beacon Street, I crested a wave of energy that allowed my tired legs to churn past dozens of competitors. And while pointing to the name sign on my chest hundreds if not thousands of spectators cheered me on, “Rick, Rick, Rick!” like I was a World Series champion. Approaching mile 25 my energy had reached a crescendo and flexing my muscles in Tarzan-like fashion, I screamed as excitedly as I could to the emptying Fenway crowd, 25-deep along the barricade. The loudest crowd cheer for anything I had done in my life erupted around me making my ears ring. It continued as I put my fist in the air, past the mile 25 marker. One of life's greatest adventurers. The Boston Marathon is the world’s oldest annual marathon and one of the few marathons to have been held prior to the distance being expanded to 26.2 miles. It is not the original marathon, which dates back to Marathon, Greece.